Technology is always something that has peaked my interest and has always excited me. 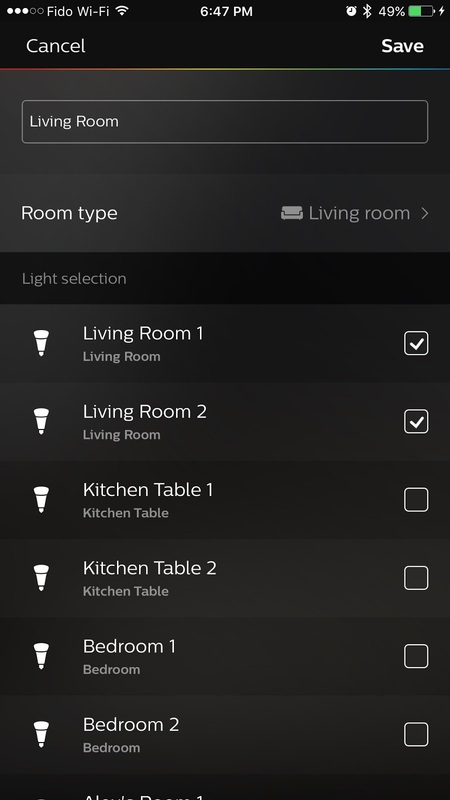 I mainly focus on Mobile tech, but this time I've jumped into Home Automation with Philips Hue products for all my lights throughout my house. 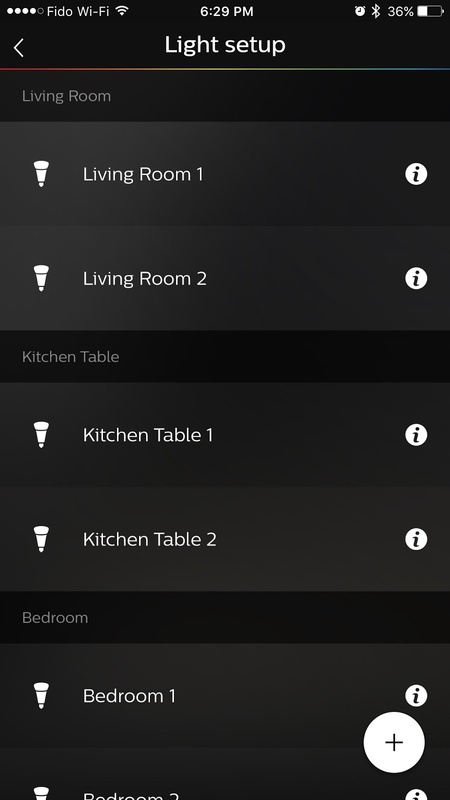 I've had such a fun and educational week playing with these, I wanted to share my experience with this Philips Hue Setup, Available for both iOS and Android. I initially started with just a couple lights for my living room, but then I very quickly fell in love with the idea of total control over the lights. It didn't take me long to find myself heading down to the store, once again filling my basket with nearly everything I could find. 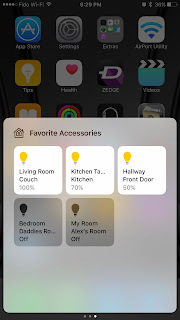 The brain of the whole operation is the Hue bridge, which will be the hub for all your home automation, and is controlled via your phone, smartwatch, or optional hardware switches you can buy. It simply requires power (obviously) and a wired connection with available WiFi for your house. 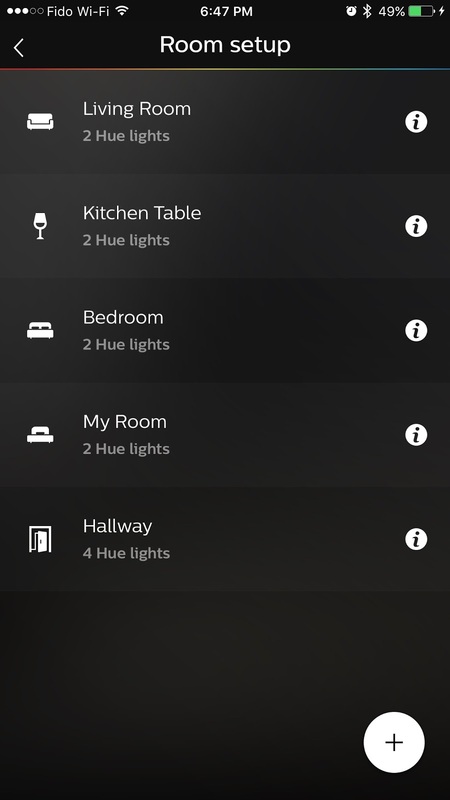 The initial setup of things is a bit messy, due to the not so user friendly Philips Hue app that's required to setup your lights and rooms up. Once you get the learning curve down, it does become a little easier, but be prepared to spend a good 30 minutes or more getting everything tweaked and setup. Upon screwing in each of your lightbulbs and ensuring the power is on, they'll light up to 100% instantly. 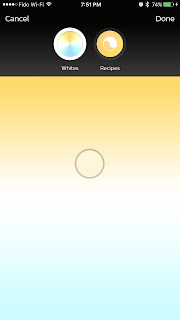 At the this time they start looking for the bridge and Wifi, which you'll use the Hue app to find them. Once you find them, you assign them to a room, and combined them with other lights for simultaneous operation for a room, or as just a single light. 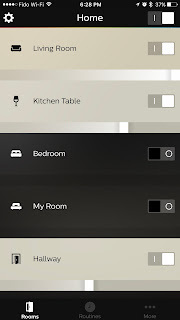 Once you have all your desired rooms setup, then the automation tweaking is next on your setup list. 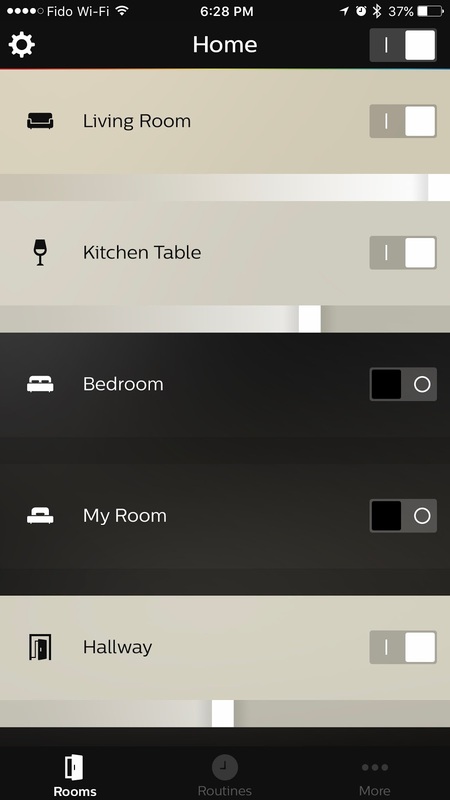 You'll be able to manually control each room from 0% to 100% brightness using the sliders for each room you've assigned, or voice commands such as, "Turn Hallways lights on" or "Turn Hallways lights on to 35%". 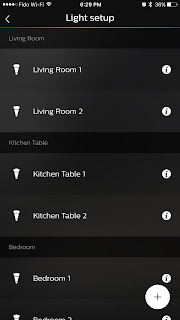 You can assign multiple rooms to a single switch, and even use a universal light command like "Turn off all the lights". Now we dip in to the automation. 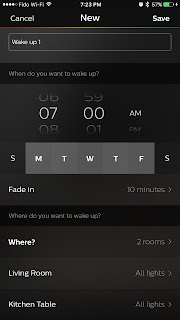 I've shown some setup examples above on how you can assign timers and location into the mix. I'll share my personal setup to give you an idea of what you can do, and to what extent. Monday - Friday at 5AM, my Bedroom Lights turn on at 10% and Hallway at 30% with my morning work alarm. 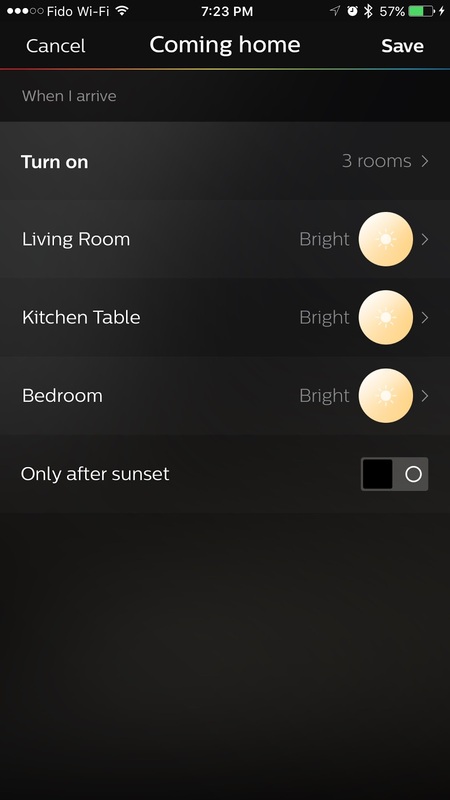 Everyday at Sunset, the living room and Hallway turn on to 30% for ambient light. 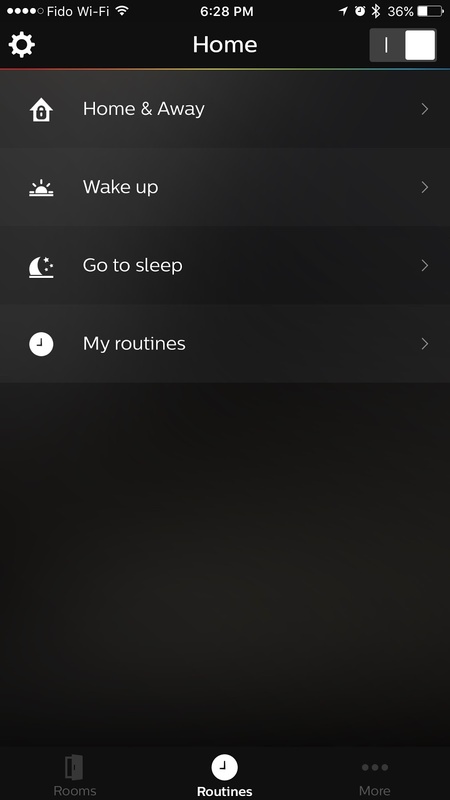 Everyday at 9PM, all lights except living room turn off, Bedroom turns on to 50% for me to get ready for bed. 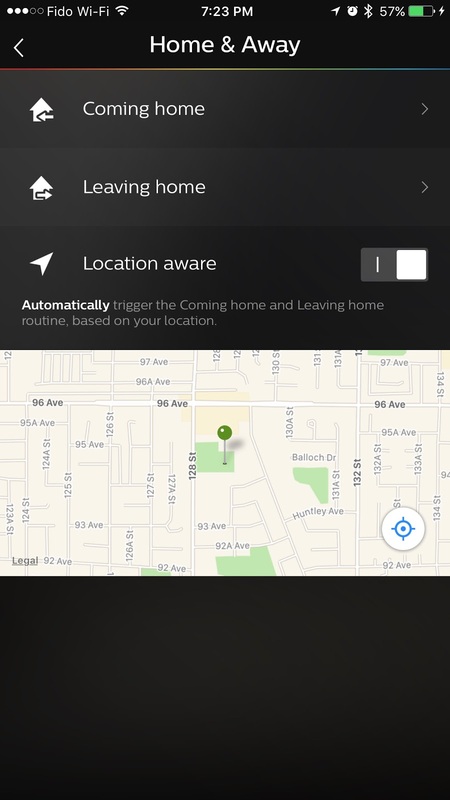 Location Base: When I leave within 100 Meters of my house, my Hallways lights turn off. Location Base: When I enter my area within 100 Meters, my Hallways lights turn on 70%. Fun: as a little extra cool feature, if you make a Hue Account within the Philips Hue app, you'll be able to control your lights anywhere, even outside your WiFi coverage. 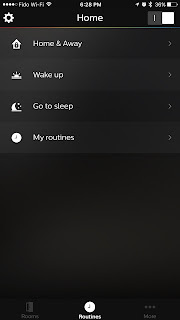 These are just some of the things I have implemented so far, of course you can still manually control the lights for further control and adjustments. Now we move onto sensors. I have two of these, each setup in the 2 bedrooms we have in our place. I have them positioned above the door pointing down, but they have a wide field of view that covers the entire room. They activate the moment you step through the doorway, or move within the room. 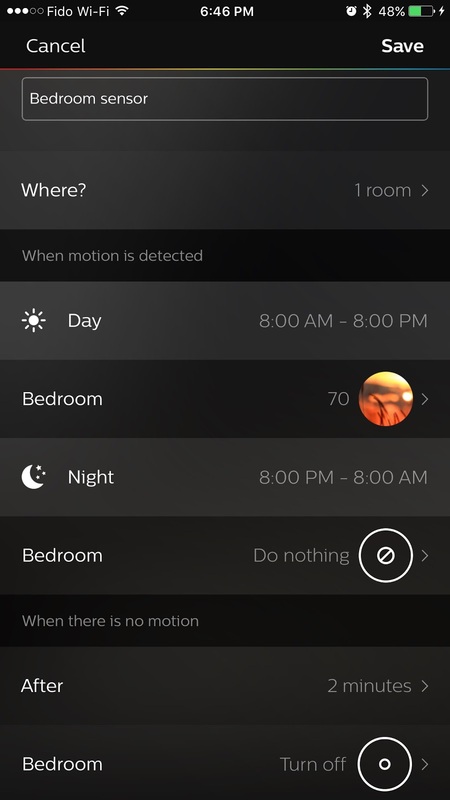 You decide what happens when moments are detected, and can have different reactions based on the time of day, light in the room, etc. 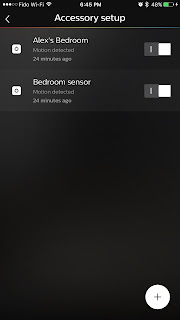 Each sensor is powered by 2 AAA batteries which are included, and Philips claims they last 2-3 years on normal use. 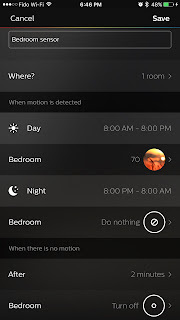 You assign which room or multiple rooms turn on when movement is detected, what brightness they turn on at, and the sensitivity of the movement is required. 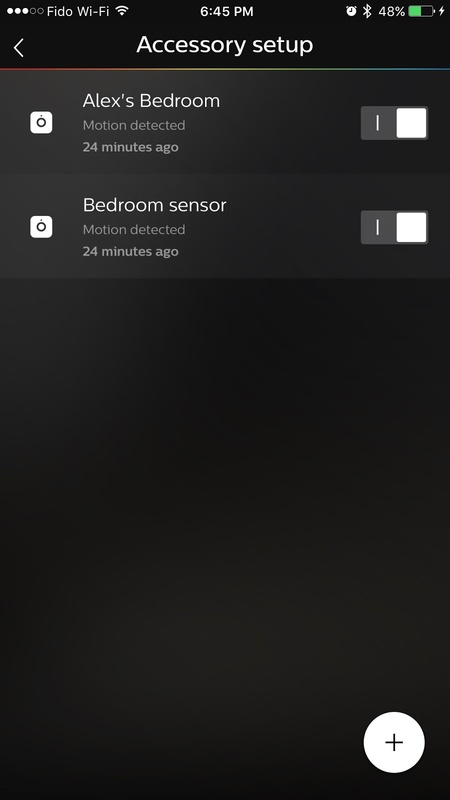 You'll also be able to assign what happens after X minutes of no motion detected such as the lights turning off, or lowering the brightness until the next time motion is detected. 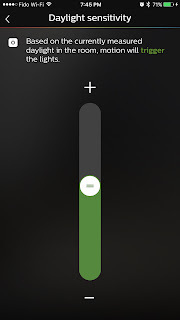 On top of this, you have a Daylight sensitivity slider. 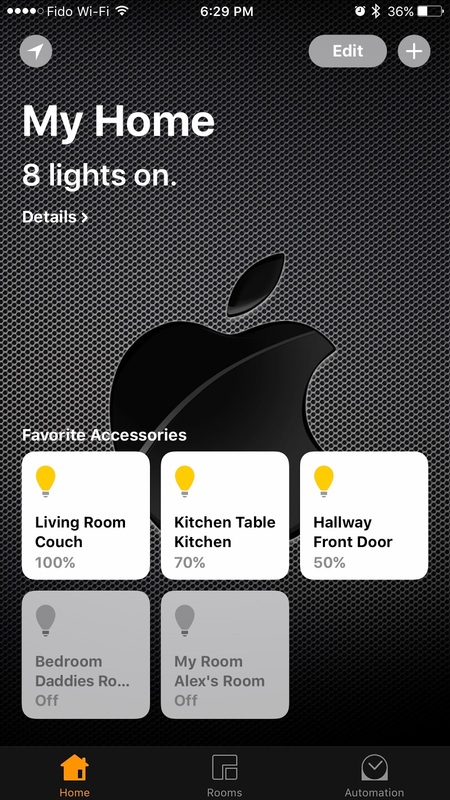 You'll be able to have the sensors deactivate themselves if they sense there's enough light in the room already, to further save power. Adjusting the slider will tell you whether the sensor has enough light to trigger or not in real time, giving you total confidences and control over this setting during the setup. 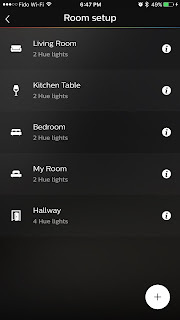 Now you've setup all your lights, rooms, timers, locations, sensors, now it's time just to get a little extra fancy and have a little fun. 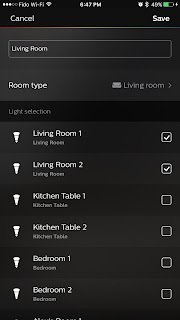 You can buy additional lights such as the one above I got my living room, but they are nearly double the price of a standard Philips Hue lightbulb. These ones allow me to adjust the temperature of the light produced to set values, or by the colour pallet. I've set each light to the warmest, and the coldest to give an example of their limits. You can buy actual colour lightbulbs with the full colour spectrum such as Red, blue, yellows, however $50 for each of the coloured lightbulbs was just a little to rich for my blood, so I stuck to the basic whites. 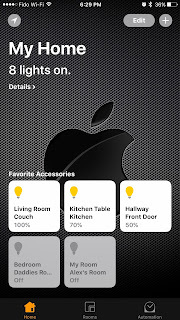 Apple TV for TV commands and Voice Commands via TV Remote. 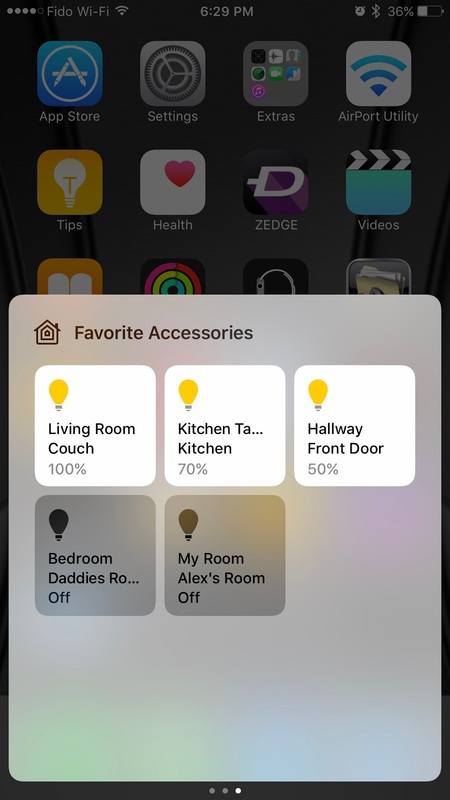 Home Automation isn't something people need, but they're a lot of fun and can come in handy if you set them up around your life schedules. I got a chance to explore and play around with a new side of Tech that I haven't even had a chance to before, and I absolutely love it. I can't see myself going back to standard lightbulbs anytime soon. You can purchase these products online via various retailers, I personally bought most my stuff from my local BestBuy store. I hope you guys enjoyed the review, and I'll do my best to answer any questions that may arise in the comments below.